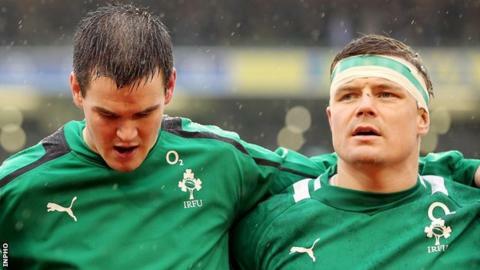 Brian O'Driscoll and Jonathan Sexton have recovered from injuries and will play for Ireland against New Zealand. Centre O'Driscoll had been a doubt because of a calf problem while fly-half Sexton limped out of the Australia defeat with a hamstring injury. Gordon D'Arcy is recalled at inside centre to resume his long-standing partnership with O'Driscoll. Winger Tommy Bowe says Ireland have to believe they can beat New Zealand for the first time. Kearney replaces Fergus McFadden who will be out for several weeks after fracturing a bone in his hand against the Wallabies. Sexton had been told by head coach Joe Schmidt that he had to train fully in Friday's session to warrant selection for the daunting test of hosting the world champions, who are unbeaten in 2013. The 28-year-old Racing Metro player came through that challenge, to retain his starting berth after limping out of the 32-15 Australia defeat at half-time. Former captain Brian O'Driscoll has beaten his continuing calf trouble to line up in midfield, where he will equal Ronan O'Gara's all-time Ireland caps record of 128. It will be the 34-year-old's last match against the All Blacks before retiring at the end of the season. Ireland have never beaten the All Blacks, with O'Driscoll on the losing side in 12 meetings. However, coach Schmidt insisted: "In any two horse race, there are no certainties. "We have worked hard defensively and there are even more threats in the repertoire of the All Blacks than the Australians so we are going to have to be not just better, but a lot better." New Zealand have made several changes from the team which beat England last weekend. Aaron Cruden starts instead of fly-half Dan Carter, who went off injured at Twickenham, while Cory Jane returns on the wing. Prop Tony Woodcock misses out because of injury as Charlie Faumuina, Andrew Hore, Wyatt Crockett form a refreshed front row. Ireland: R Kearney, T Bowe, B O'Driscoll, G D'Arcy, D Kearney, J Sexton, C Murray; C Healy, R Best, M Ross, D Toner, P O'Connell (cpt), P O'Mahony, S O'Brien, J Heaslip. New Zealand: I Dagg, C Jane, B Smith, M Nonu, J Savea, A Cruden, A Smith; K Read, R McCaw (cpt), S Luatua, S Whitelock, L Romano, C Faumuina, A Hore, W Crockett.